Largemouth bass approximately 30 cm (12”) long. Location: Deer Creek, California Date 6/22/2007. Largemouth bass, captured from Snodgrass Slough, CA, and released. Length = 22.75" (57.8 cm). Weight (est.) = 9.2 lb (4.17 kg). Photo by Gary Riddle. Largemouth bass (showing maxilla) caught in Lake Berryessa Reservoir in March 2009 by Teejay O'Rear. Photo by Amber Manfree. Largemouth bass, approximately 17.5 cm (7”) long. Location: Deer Creek, California Date: 6/20/2007. Note: maxilla is less pronounced in juveniles than in adults. Largemouth bass, approximately 11 cm (4.5”) long. Location: Deer Creek, CA. Date: 6/20/2007. Note: maxilla is less pronounced in juveniles than in adults. Largemouth bass, approximately 11 cm (4.5”) long. Location: Deer Creek, CA. Date: 6/20/2007. 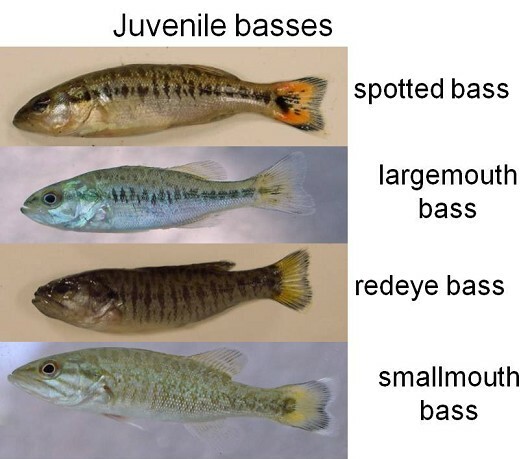 Juvenile basses. Photos courtesy of Patrick Crain and Scott Matern. 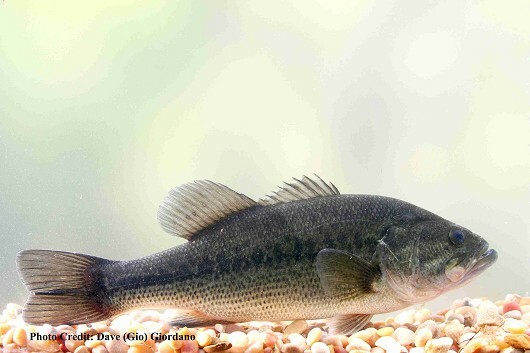 Largemouth Bass are most common in warm shallow waters with moderate clarity and beds of aquatic plants. This includes farm ponds, lakes, reservoirs, sloughs, and river backwaters. They may be pushed out of streams by high flows but will survive in flooded areas and recolonize when the flows drop again. Lake populations stay close to shore in water 1-3 m deep. 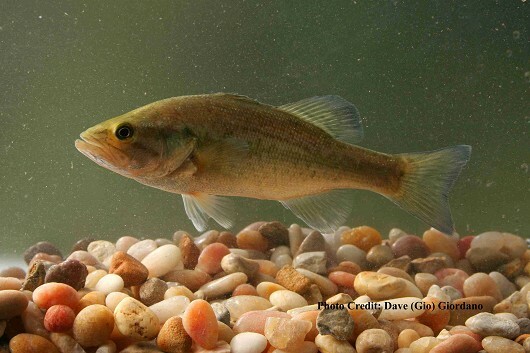 Largemouth Bass can survive temperatures up to 36-37°C but 27°C is generally preferred. They can also survive in water with dissolved oxygen levels as low as 1 mg/L but will avoid areas with salinities higher than 3 ppt and are intolerant of high alkalinity levels. Juveniles and populations in crowded lakes may school but the majority are solitary hunters that stalk around a piece of submerged debris or roam widely in open water. Foraging happens throughout the daylight hours but is most intense at dusk before becoming almost completely nonexistent at night. 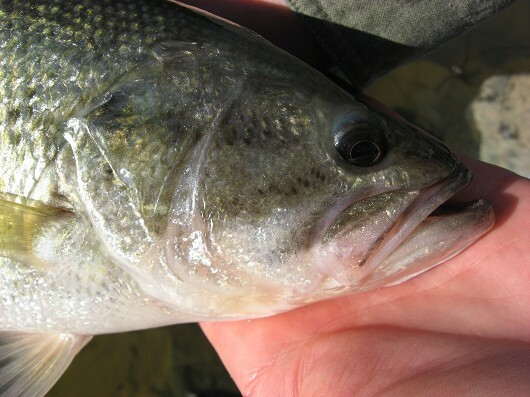 Pursuit and ambush strategies are both used to catch prey and a Largemouth Bass’s behavioral preference will change with availability of prey and the habitat. 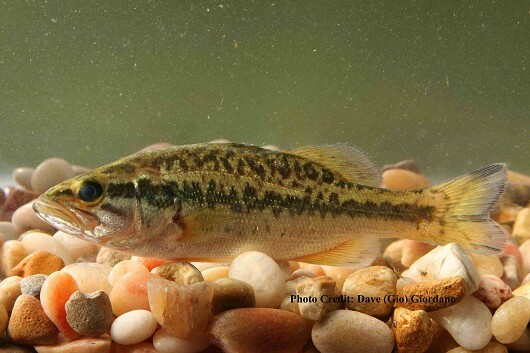 This changing of behavior will often lead to a Largemouth Bass specializing in a single type of prey at least for a short period of time, but switching this focus numerous times throughout the individual’s lifetime. In general, fry feed on crustaceans and rotifers before taking on insects and fish fry at 50-60 mm in length, and becoming primarily piscivorous at 100-125 mm in length. 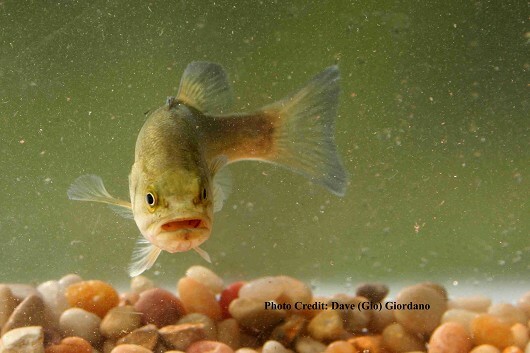 Crayfish, tadpoles, or frogs may also be preferred once a Largemouth Bass has grown large enough to digest them. Maturity is reached when males have grown to 18-21 cm in length and females have grown to 20-25 cm in length. Spawning starts in March or April when temperatures reach 15-16°C and continues through June in temperatures up to 24°C. Males build nests by brushing out shallow depressions, up to 1 m in diameter, into sand, gravel, or debris-littered bottoms. This is usually in areas 0.5-2 m deep and commonly next to submerged objects. These nests may be built close together but they are not colonial, and males will defend their nest as vigorously against other males as they would predators. Spawning is initiated by a female repeatedly swimming by a nest, changing colors, and keeping her head down in a mating posture. Eventually the pair circle the nest with the male nipping at the female and the female occasionally rubbing her abdomen on the nest floor. The pair will then settle into the nest and release their eggs and milt simultaneously. Each female may lay 2,000-94,000 eggs per season as she visits multiple males in the area. These eggs adhere to the nest and hatch 2-7 days later. The offspring stay in the nest for 5-8 days before they become free swimming, and will remain guarded by the male for another 2-4 weeks. At this point they are left to school on their own near shore. Growth is highly variable depending on genetics, food availability, competition, temperature, and other conditions. This diversity of constraints results in fish growing to anywhere between 5 cm and 20 cm in their first year, and 20 cm to 41 cm in their fourth. The largest individual recorded measured 76 cm and weighed 10.5 kg, and the oldest individual was 16 years old.